The human history of the Lower Wisconsin Riverway is long and storied. While only a small portion is touched on here, you may want to find Richard Durbin’s The Wisconsin River – An Odyssey Through Time and Space for the most complete and detailed history of the river to date. Archaeologists have found evidence of people in the Lower Wisconsin region as early as 10,000 years ago. By 1000 BC, the rich natural resources of the floodplains, terraces, and upland bluffs had attracted people who settled along the riverway. Social and religious gatherings, held in the warmer months when food was plentiful, brought people from surrounding camps together for ceremonies and trade. Pottery making appeared around this time and similarities in design linked the inhabitants of the Lower Wisconsin to traditions along the Mississippi and Illinois rivers to the south. Around the time of Christ, the first intercontinental trade network developed. Traders from the Hopewell culture, originating in Ohio, spread goods and ideas through what is now the eastern United States, using the rivers as highways. Copper from Lake Superior, shell from the Gulf of Mexico, mica from Georgia, obsidian from Wyoming and flint from North Dakota are just a few of the items that travelled the Wisconsin River at this time. These traders also brought their culture with them and we find vestiges of burial practices, pottery design, and economic and political organization interwoven with local customs. By AD 600, the influence of the Hopewell culture had disappeared and a local tradition, called Late Woodland, flourished. This tradition is unique to the area encompassing southwest Wisconsin, and portions of eastern Iowa, northern Illinois and southeastern Minnesota. The most pronounced features of Late Woodland sites are mounds in the form of birds, animals and reptiles. Numerous examples of these mounds are found on the bluffs and terraces of the Lower Wisconsin. This mound building tradition continued until about 1300 AD. It was also during this time period that the bow and arrow and corn were introduced to the region. In the 1600s and 1700s, European explorers and fur traders recognized the importance of the river highway. Nicolet, Radisson and Groseilliers, and Marquette and Joliet traversed the rivers between Prairie du Chien and Green Bay on their way to claim lands for France. Entrepreneurs such as La Salle and Perrot established trading relations with the native people they found along the rivers. In 1766, Jonathan Carver described his journey down the Lower Wisconsin. Near present day Prairie du Sac, Carver sighted a large village occupied by Sauk Indians whose chief was Pyesa, the father of Black Hawk. Two years after Carver’s visit, the Sauk moved their village to the Rock River in Illinois. It was in this village, Saukenauk, that the seeds of the Black Hawk War were sown. The importance of the lead mines of the Lower Wisconsin region was recognized as early as the American Revolution. The Sauk and Fox Indians, under the direction of Julien DuBuque, shipped large quantities of lead to American markets in the east. In 1804, the Sauk and Fox entered into a treaty with the United States government. This treaty caused thirty years of unrest, culminating in the Black Hawk War of 1832. The United States government began leasing mines in 1817 and by the 1830s, the region was the most densely populated area in the Northwest territories. The increasing number of skirmishes between settlers and Indians led to the construction of two military forts along the Lower Wisconsin; Fort Crawford at Prairie du Chien and Fort Winnebago at the portage of the Wisconsin and Fox rivers. In 1831, the United States government moved the Sauk and Fox from their Illinois lands to the western side of the Mississippi. 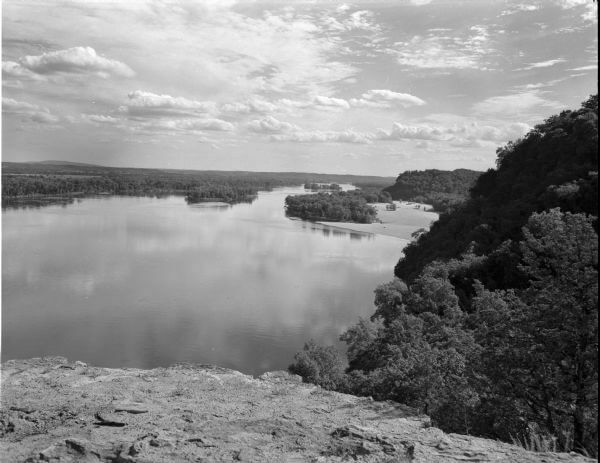 In April of 1832, Black Hawk and 1200 men, women, and children crossed the Mississippi to return to their village on the Rock River. This crossing began a four month long conflict called the Black Hawk War. 4500 American regular and volunteer troops chased Black Hawk and his band through northern Illinois and southern Wisconsin. The war ended with the Battle of Bad Axe where all of the band except Black Hawk and few of his followers were captured or killed. Black Hawk was taken prisoner three weeks later. The war had cost the Americans about 200 men in the fighting, less than 150 of Black Hawk’s band had survived. One of the most important encounters of the war, called the Battle of Wisconsin Heights, occurred at a crossing on the Lower Wisconsin River south of Prairie du Sac. Black Hawk hurried his starving band to the river with soldiers in close pursuit. Greatly outnumbered, the Sauk chief and a few warriors stopped the troops advance as the remainder of the band built rafts to cross the river. The battle lasted for two hours in pouring rain until sunset. The American soldiers camped at the base of the bluffs that evening ready to resume fighting at the first sign of daylight. At sunrise, they found that Black Hawk had moved his band across the Wisconsin during the night and disappeared into the rugged country north of the river. Black Hawk’s strategy in this battle has been acclaimed as one of the most skilled in the American Indian Wars. By 1848, when Wisconsin became a state, steamboats plied the river. Communities grew up along the river competing for leadership in the transportation industry. The railroad entered the area in the 1850s and bypassed the river communities as it sought a more direct overland route between the major ports and cities. Even though the Lower Wisconsin is no longer used for transportation of people and goods to major markets, the shores and valleys of the river still hold the echoes of its former glory. Thousands of years of human occupation remain buried within the valley walls. Keeping the river free of intensive development will ensure that this history will be preserved for generations to come. This was accomplished with the creation of the Lower Wisconsin State Riverway in 1989 which now encompasses nearly 80,000 acres and protects that last 92.3 miles of river from Prairie Du Sac down to the Mississippi confluence. To this day the riverway protects the scenic and undeveloped viewsheds from the scars of progress. A trip down the Wisconsin today looks nearly the same as it would have been hundreds of years ago.